In the U.S. Senate Thursday, two bills that would have ended the partial government shutdown failed to get enough votes to advance. Alaska’s senators took different tacks. Sen. Lisa Murkowski struck a moderate position. She said she disliked aspects of each bill, but she voted for both of them. “I’m trying to figure out a way to get the government open,” she said. The first vote was on a Republican bill that included money for the border wall President Donald Trump has been promising. Fifty senators voted for it, including one Democrat. The next vote was for a Democratic proposal to fund the closed departments for two weeks to allow time to negotiate a border security proposal. Murkowski was one of six Republicans who crossed the aisle to vote for it. It got 52 votes. Both measures failed to get the 60 votes needed to advance. Murkowski said she’s hearing from proud Coast Guard spouses who are angry to find themselves having to visit food banks because they don’t know when they’ll get paid again. Sen. Dan Sullivan stood with the president and the Senate’s Republican leadership. He voted for the Republican bill and against the Democratic measure. He says, in a written statement, the president would’ve vetoed the Democratic bill, so that would’ve only continued the gridlock. Right after the votes, Murkowski led a bipartisan call from the Senate floor for a temporary measure to re-open government. 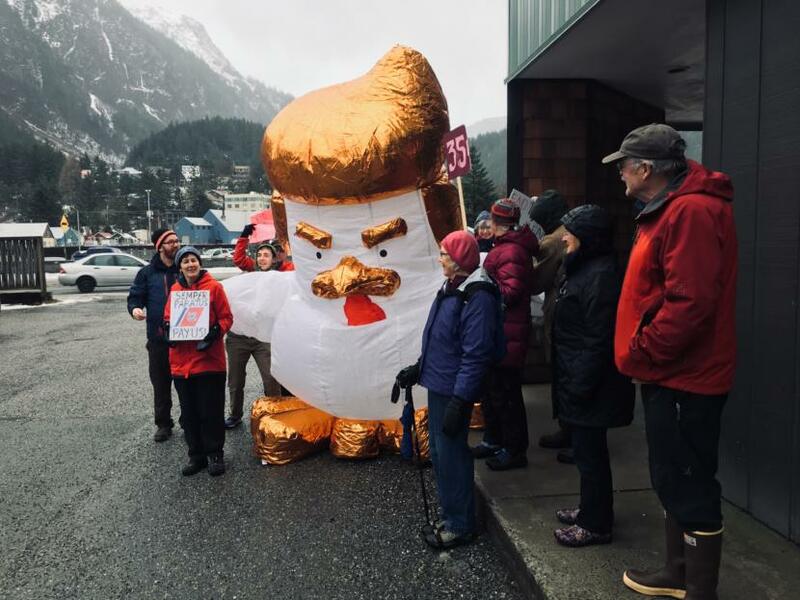 At the same time, a small knot of protesters gathered outside the senators’ offices in Juneau. “End the shutdown!” they chanted. They carried protest signs and also a giant chicken balloon with a swoop of orange hair to lampoon the president.